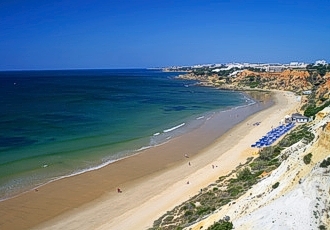 The Sheraton Algarve Hotel stands proudly on a cliff-top surrounded by pine trees and overlooks miles of unspoiled beaches edging the clear, blue sea. 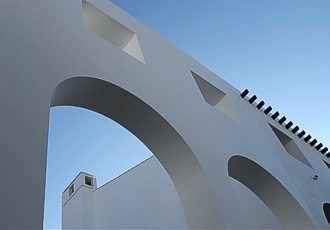 The serene architecture creates a charming combination of airy interiors, open patios, intimate spaces, and gardens. 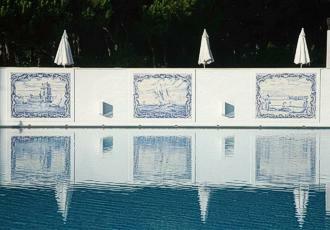 Influenced by Portugal's Arab heritage, Sheraton Algarve Hotel features a rich cultural history and attentive service. 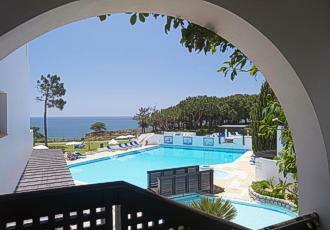 Enjoy Albufeira's surroundings at the exciting Pine Cliffs 9-hole Golf Course or the golf academy or be revitalized by the clear water of one of our swimming pools. Relax at the outdoor atmosphere of O'Pescador - our gourmet restaurant featuring the freshest seafood and breathtaking ocean views. Experience a variety of atmospheres offered by our wonderful restaurants. All of our 215 enticing guest rooms provide guests with an unforgettable luxury resort experience. Experience the traditional Arab decor of lavish fabrics, potted plants, intricately carved headboards, and exotic tiled walls. World-class luxury is presented to you with bathrobes and slippers, turn down service, in-room movies, and 24-hour room service. Enjoy the surrounding atmosphere on a private balcony or terrace. 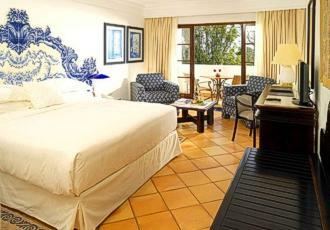 The Sheraton Algarve Hotel offers 215 fully air-conditioned/heated guest rooms, including Deluxe Rooms, Grand Deluxe Rooms, Junior Suites, and Luxury Suites (bi-level), with land, garden, and ocean views. All accommodations include in-room safe, direct dial phones with data port, bathrobes and slippers, turn down service, mini bar, satellite television, in-room movies, private balcony or terrace, and 24-hour room service. 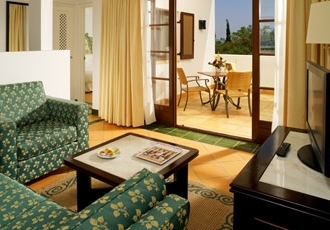 Connecting rooms are available for families. Should you wish to reserve connecting rooms, please contact the hotel. Recalling the region's Moorish heritage, our 34 square metre Deluxe Rooms are sanctuaries of serene comfort with crisp white linens contrasting beautifully with dark wood furniture. A headboard of hand painted blue, green or red Portuguese tiles crowns our signature Luxury Collection Bed, adding a touch of local colour to the airy space of a room. Floor-to-ceiling French doors open onto a balcony overlooking spectacular cliffs and the Atlantic, landscaped gardens or the cobble stoned surroundings. The room's spacious design provides for a seemingly separate sitting area with a wooden table and two chairs covered in fabric of traditional Arabian design. A writing desk with direct-dial telephone and data port is the ideal spot to connect a lap top and dial into the hotel's High Speed Internet Access, available for a nominal fee. A 27" flat screen television features Video On Demand and a variety of satellite channels. Graciously appointed bathrooms are adorned with hand painted Portuguese tiles and ceramics and feature an indulgent rainforest shower, hair dryer and magnifying mirror. Our line of Luxury Collection toiletries includes custom-blended soaps, bath gel, shampoo, conditioner and body lotion. After a day exploring the Algarve, wrap yourself in our plush bathrobe and comfy slippers. 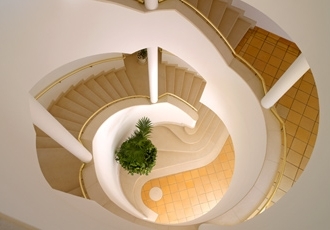 Completely renovated in 2007, all rooms feature individual air conditioning controls and private safe. A well-stocked mini-bar, 24-hour room service and nightly turn down ensure every need is attended to with gracious attention to detail. The generous space of our 45 square metre Grand Deluxe Rooms allows for a step-down sitting area separated from the bedroom by an elegant balustrade of marble and regional stone. Opening onto a spacious private balcony, the living area includes a sofa (convertible to a sleeper), table, chair and writing desk - the perfect vantage to entertain and enjoy stunning vistas of the Algarve. 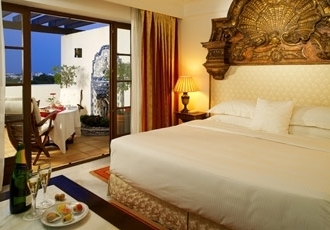 The room's inviting ambience features a clean contrast of crisp white linens, amber-tiled floors and fabrics of traditional Arabian design recalling the region's Moorish heritage. Touches of modernity inlcude a 27" flat screen television, Video On Demand, satellite channels and a direct-dial telephone with data port. 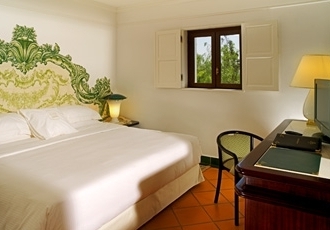 Views of the Atlantic Ocean or the lush hotel gardens are unobstructed from the sleeping area which features your choice of double or twin Luxury Collection Beds, all crowned with a decorative headboard of authentic Portuguese tiles. Graciously appointed bathrooms are adorned with hand painted Portuguese tiles and ceramics and feature an indulgent rainforest shower, hair dryer and magnifying mirror. Our line of Luxury Collection toiletries includes custom-blended soaps, bath gel, shampoo, conditioner and body lotion. After a day exploring the Algarve, wrap yourself in our plush bathrobe and comfy slippers. 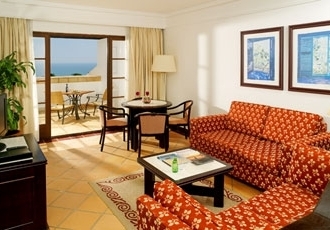 Featuring a separate living room and bedroom, the spacious 41 square metres of our Junior Suites create a welcoming space with incredible views of the Atlantic Ocean or hotel gardens. The living area features a sofa (convertible to a sleeper) and comfortable chair in fabrics of traditional Arabian print, coffee table and 27" flat screen Samsung television. With French doors leading to a private balcony, it is an ideal space for enjoying moments of quiet relaxation or entertaining with newfound friends. 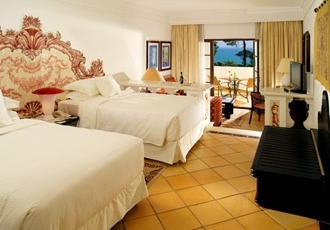 The bedroom is a sanctuary of comfort with our signature Luxury Collection bed crowned by a decorative head board of hand painted Portuguese tiles. The traditional design of the tiles blends beautifully with the suite's crisp white linens, dark wood furniture and amber-tiled floors. A second 27" flat screen television also features Video On Demand and dozens of satellite channels. Bathrooms are a statement of style with hand painted Portuguese tiles and ceramics as well as an indulgent rainforest shower, hair dryer and magnifying mirror. Blending authentic Portuguese charm with modern amenities, the 55 square metres of our bi-level Luxury Suites creates an ideal retreat offering a balance of private space and generous accommodation for entertaining. 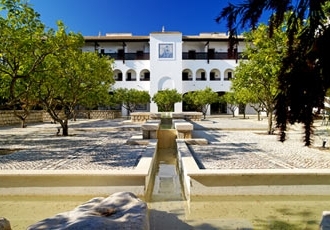 With views overlooking the Atlantic Ocean, the Monchique Mountains or the hotel's expertly landscaped gardens, the ground floor living and dining area features two sofas upholstered in traditional Arabian prints, coffee table, 27" flat screen television with entertainment system featuring Video On Demand and satellite channels, and a dining table with four chairs. French doors open onto the spacious balcony, creating a lavish space for entertaining. A first-floor guest bathroom is accented with Portuguese ceramics and tiles. 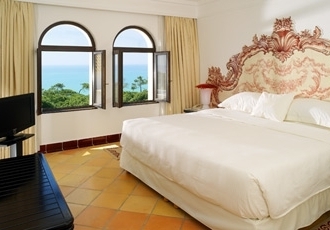 Upstairs, the master bedroom welcomes you with our signature Luxury Collection beds - available in double or twin - and the same stunning views of ocean, mountains or gardens. A head board of hand painted Portuguese tiles done in a traditional design adds a touch of authentic charm to a comfortable space featuring modern amenities such as another 27" flat screen Samsung television. A direct dial telephone includes a data port for laptop connection to High Speed Internet Access, available for a nominal fee. Completely renovated in 2007, all suites feature individual air conditioning controls and private safe. A well-stocked mini-bar, 24-hour room service and nightly turn down ensure every need is attended to with gracious attention to detail. There is only one Neptuno Suite and its incredibly spacious 86 square metres is reserved for the most discriminating of travellers. Interiors play tribute to the region's Moorish heritage with a warm palette of cream and ivory colours juxtaposed with ornately carved furnishings, original Portuguese tiles and ceramics, amber-tiled floors and luxurious ornamental rugs. A private terrace with a water fountain tiled in a traditional Portuguese design of blue and white features cushioned chairs and chaise lounge and stunning views of ocean, sky and a cliff-lined coast. Within, a spacious living and dining area includes a dinner table seating eight . A 32" flat screen television has a sophisticated entertainment system with DVD player, Video On Demand and dozens of satellite channels. Three direct dial telephones offer voicemail and a data port ideal for tapping into the hotel's High Speed Internet Access, available for a nominal fee. A kitchen area features a mini-bar well-stocked with premium brands. The master bedroom features our signature Luxury Collection Bed, adorned with an intricately handcrafted wooden headboard reminiscent of the 15th century, a spacious walk-in wardrobe and a 27" flat screen television. 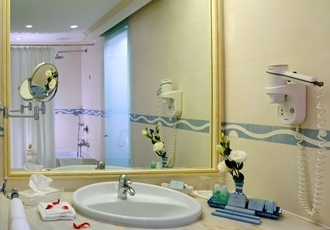 The exquisite bathroom features an indulgent rainforest shower, hair dryer and magnifying mirror. Our line of Luxury Collection toiletries includes custom-blended soaps, bath gel, shampoo, conditioner and body lotion. After a day exploring the Algarve, wrap yourself in our plush bathrobe and comfy slippers. With one of the world's most unique and celebrated addresses, our spectacular setting lends itself to rich and memorable travel experiences. Follow the blue signs in the direction of A22/Portimão. Take Highway A22 - Via do Infante and continue to the Boliqueime Exit. Exit here and continue to the traffic lights on Boliqueime. Turn left at the traffic lights on E.N.125 Road. Continue along E.N 125 until road curves and Albuferia/Praias sign is posted on the right. Turn right and continue to 1st roundabout. Take the 3rd exit. At the next roundabout take the 2nd exit. Continue until reaching another roundabout. 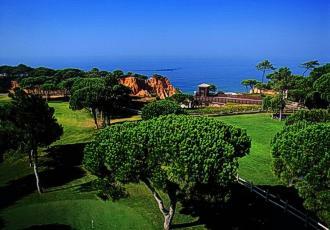 Take the 2nd exit along this road, you will find the entrance to the Sheraton Algarve Hotel at Pine Cliffs Resort on your right. (approximately 30 kilometers). Fishing Harbour, Albufeira 7.0 km/4.3 miles, Bull Fighting 8.0 km/5.0 miles, Marina de Albufeira 9.0 km/5.6 miles, Casino de Vilamoura 10.0 km/6.2 miles, Baroque Church, S. Lourenco (National Monument) 20.0 km/12.4 miles, Moorish Castle of Silves 35.0 km/21.8 miles, Palace Gardens and Roman Ruins 40.0 km/24.9 miles, Faro (Capital of Algarve) 40.0 km/24.9 miles. Your reservation is guaranteed to have the best rate available on the Internet. If you find within 24 hours after booking, a lower rate for our hotel on another website for the same room type, dates, and payment requirements we will match this rate. Just let us know on the form below the dates and services you are considering and we will come back to you with our best rate.